Includes GREEN Font print with black backer included! Includes BLACK Font print with white backer included! Includes Black Font print with Custom WHITE backer included! Correct spring clip for installing heater control lens. (Some cars only require 2). 1969 1970 1971 1972 1973 1974 1975 1976 1977 1978 1979 1980 1981 Camaro. 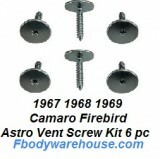 This is a 6 pc kit of new replacement dash vent screw for astro vents. 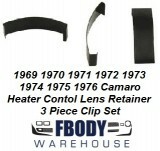 for use on 1968 1969 Camaro and Firebird models.